Robert F. Langlois, 81 years old, passed away peacefully early Tuesday evening February 27, 2018 at High Pointe Hospice House in Haverhill with his loving family by his side. He was the beloved husband of 48 years to the late Rose (O'Connell) Langlois, who died in March 2015, and loving father of two sons. 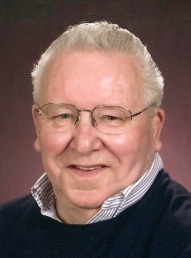 Born in Lowell, on August 1, 1936, a son of the late Alfred and the late Genevieve (Siara) Langlois, he attended St. Stanislaus grammar school and Lowell High School. A long-time resident of the Highlands section of Lowell, he was a devoted parishioner of St. Margaret Church. Prior to his retirement in 1996, Bob was employed as Shipping Supervisor for 37 years at M/A-Com in Burlington, MA. Bob had a love for nature and in his younger days enjoyed fishing during summer and winter. For many years, he happily hosted family gatherings. Bob and Rose enjoyed several decades of summers spent at their Barnstead NH camp, and had many happy trips to Las Vegas, Jacksonville FL, and Southern California. A kind and charitable man of deep religious faith, his family and friends will remember Bob at his best, with his Rose by his side, and telling a good joke. He is survived by his sons and their spouses, Gary Langlois and his wife Susan Langlois of Gloucester, and Mark Langlois and his husband Aaron Reza of Los Angeles; a brother, Michael Langlois and his wife Carol of Dracut; sister-in-laws Claudine Langlois and Ruth Couture of Lowell, and Patty Dooley and husband Neil of Billerica; brother-in-law Bill O'Connell and partner Frank DeLuccia of Laguna Niguel CA and many dear nieces and nephews. Bob was also preceded in death by his first wife Jane (McCartney) Langlois, his older brother Richard Langlois, and his best friend Robert Fadden. Friends may call at the O’DONNELL FUNERAL HOME 276 PAWTUCKET ST. at Fletcher from 2 to 6 P.M. on Sunday. Relatives and friends are invited to attend his Funeral Mass on Monday morning at ST. MARGARET CHURCH in Lowell at 10:30 A.M. followed by burial at St. Mary Cemetery in Tewksbury. E-condolences/directions at www.odonnellfuneralhome.com. Those wishing may make contributions in his memory to St. Margaret Parish Renovation & Relief Fund, 374 Stevens St, Lowell MA 01851 or Merrimack Valley Hospice House 360 North Ave Haverhill MA 01830. Arrangements by Funeral Director James F. O’Donnell, Jr. (978) 458-8768. Mark, Aaron, and the entire family. Please know that you are in our thoughts. We are here for you. We are so sorry for your loss. We are here for you. So sorry to hear of your passing "Uncle Bob". You had a big heart, and always put on the biggest Thanksgiving feast EVAH! You were always good to my Dad, Harry. Exchanging many jokes and sharing many laughs over the years. Dad used to say "I like Bob... For Christ's Sake" One of your many funny little sayings. We will miss you, but you are now with your best friend Rose and in a happy place.